Looking back one last time at the 8U Swarm’s accomplishments this past weekend indicates a lot of positive signs as the team starts tournament play this summer. The adage that defense wins championships was certainly the case in the California State Games. The Swarm had the least Runs Allowed in the tournament giving up only 11 runs in 24 innings (less than one-half run per inning). Defense was solid, allowing only 40 hits (including 4 extra base hits) in 112 at-bats for a batting average of .357 for the opponents. The outfield accounted for 16 of the 72 total outs catching 9 fly balls and 7 assists from the outfield. The team also turned 6 double plays. The team accomplished these stats while adhering to a tournament rule where no player could play the same position for more than two innings. Despite juggling the lineup, the boys stepped-up to their responsibilities. Offensively, the Swarm out-hit and out–slugged their opponents with a batting average of .436 (58 for 133) and 8 extra base hit (including 2 home runs). This was quite a feat considering the dimensions of the field – longer bases at 60 feet and shorter fences at 138 feet. 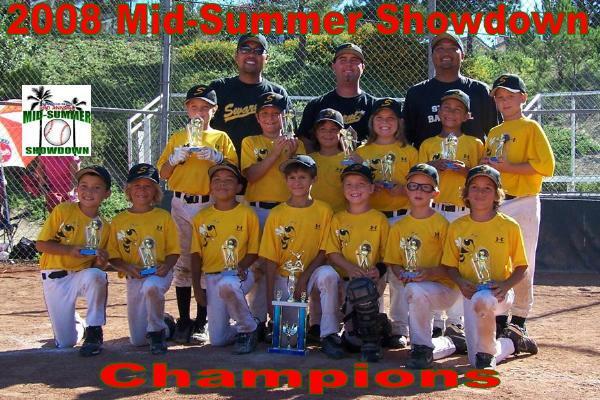 The 8U Swarm will take some time off before preparations start for its next local tournament. The team looks forward to participating in its first national tournament when it plays in the Fall Nationals in Henderson, NV on September 12th through 14th. Check Photo Albums to view pictures from this weekend. 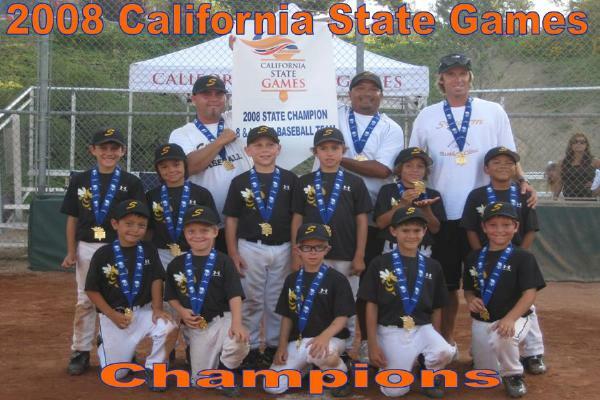 The 8U Swarm completed a perfect tournament record of 4-0 to be crowned 2008 California State Games Champions. The Swarm dominated La Mesa National enroute to a 12-3 victory in the semifinal game. After spotting La Mesa a run in the top of the first inning, the team took control of the game in the bottom of the first inning amassing 15 hits. Steven, Colin, Jacob, Devin and Brayden led the attack with two hits each. Devin and Brayden powered-up to provide extra base hits. Anthony, Cameron, Vincent, Kaden and Ben added singles. Defense was solid with 2 1-2-3 innings. Other than two solo home runs, a La Mesa runner never passed 2nd base after the first inning. In the Championship game, the Swarm out-lasted the Eastlake Mashers in a 3-1 victory in a well played game by both teams. Each team was held scoreless for the first three innings, until each team broke through with a run in the 4th inning. The Swarm grabbed the lead in the 5th inning as Ben (Birthday Boy), Anthony and Cameron pieced together base hits to provide the go-ahead and insurance runs. Anthony (3-for-3) and Brayden (2-for-2) led the way on offensive with Cameron, Steven, Devin, Vincent and Ben adding hits. Congratulations also goes to Swarm player Trace Bingham who won a bronze medal with Team Tecolote. The Swarm boys look forward to having Trace on their side again in upcoming tournaments. The Swarm started tournament play slowly but finished the first day of competition in Swarm fashion. After spotting La Mesa National four runs early, the Swarm bats were awaken as the team battled to a 6-5 victory in 7 innings. The win included 15 hits with six players - Anthony Williams, Cameron Rainaldi, Colin Medina, Devin Padua, Brayden Chalfant, Steven Rydelski - collecting two hits each. The game's first highlight was a game-tying home run by Dylan Suitts. The ultimate highlight happened in the extra inning as Steven, Vincent Pizzo, Ben Simsiman, Anthony and Cameron banged five consecutive hits in the bottom of the 7th inning to score the winning run. In the second game, the Swarm scored in every inning as it outlasting the Islander from Coronado 12 -2. Offensively, nine Swarm players collected 18 hits and eight different Swarm players scored. Anthony and Jacob Tapia lead the hit parade with three hits each (Anthony hit a two-run home run). Cameron, Colin, Devin, Kayden Hile, Steven and Ben had multiple base hits. With the only 2-0 recond, The Swarm earned the #1 seed for championship play. Their march toward a medal will start tomorrow at 12:30 against the winner of the La Mesa National/Islander game. The 8U Swarm proudly participated in the 20th Anniversary of the California State Games Opening Ceremonies marching with thousands of other athletes in Olympic style. 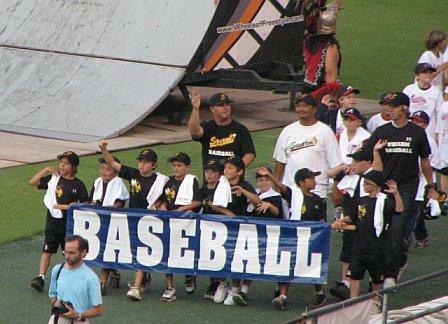 The team was the flag bearer for the entire baseball contingent leading the teams into Qualcomm Stadium as the entire stadium cheered. The evening was highlighted by emcee former-Charger Billy Ray Smith, military skydivers and fly bys, extreme BMX stunts, and The Amazing Christoper. Competition starts tomorrow with a doubleheader. The Swarm will play La Mesa National at 12:30 and Islanders (Coronado) at 5:00. 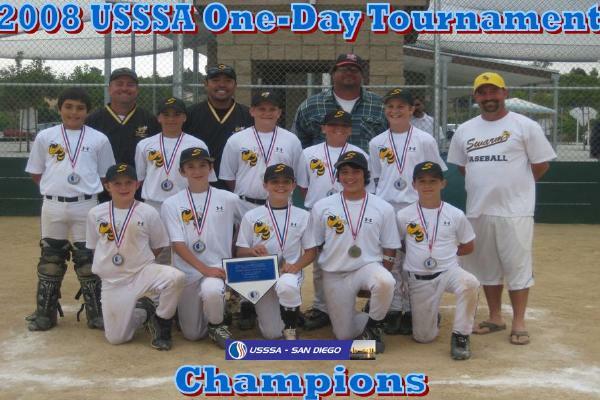 The 11U Swarm team battled to a 2-0-1 record in capturing the championship at the USSSA One-Day Tournament at the Bonita Baseball Complex on May 4. 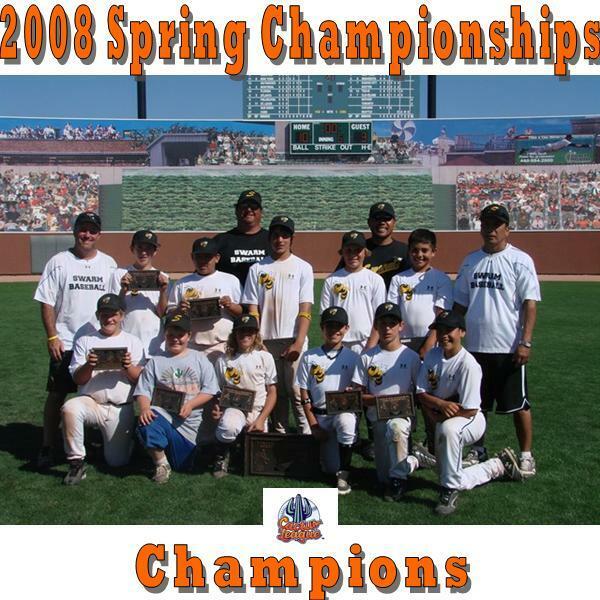 The championship was the fourth of 2008 for the Swarm, and they extended their consecutive tournament medal streak to six. In game one, Jordan Pearce struck out 10 in 5 1/3 innings, and Dylan Robertson struck out two with the bases loaded in the 6th as the Swarm and SD Snappers battled to a 6-6 tie. In games 2-3, Rob Simsiman earned both wins as the Swarm defeated the San Marcos Hurricanes 9-2 and the Rancho Santa Fe Titans 11-10 in the finals. Parker Rozenburg earned the championship game save with two innings and Dylan completed his three games in relief with another hold. Offensively, CJ Watson had a monster day with 4 HR's, going 6 for 9 with 8 RBI. Jordan had 5 hits including a HR, while Parker added a HR (he was robbed of another)and 5 RBI. Tyler Delatorre also had 5 hits and 4 RBI, Joey Wozniak, Morgan Roman-Baumeister and Dylan had four hits, and Rob, Tristan Sizik and Thomas Zlatic had multiple hit days. Yassin Wahhab added stellar defense at second to complete the team effort. The Swarm take a break for Memorial Tournament play at North City, but are gearing up for the Slumpbuster's Tournament in Omaha, NE in June. Good luck to all the players in the coming weeks. The Swarm finished up a 5-1 weekend by winning the D-2 championship 10-3 Sunday for their third championship in the last three months. The Swarm have medaled in five straight tournaments. Their only loss in this tournament was to the only other team who won five games, and they went on to win the D-1 championship. All ten players contributed to the championship. On to the games. The pitching was terrific. Dylan Robertson and Lane O'Dea both pitched identical one hit shutouts in games one and five, giving up only one walk and striking out three apiece. Dylan added two more no-hit innings to help hold the game four win for Jaylon King. (Dylan gave up one hit and no runs in five total innings.) Rob Simsiman won game three, pitching four innings and giving up only one run and four hits with 5 K's. Jordan Pearce saved game four and then got the complete game win in the championship clincher. In the five wins, Dylan, Rob, Jaylon, Lane and Jordan gave up a total of five runs. The offense was even better, batting .472 as a team and scoring 61 runs in 26 innings. Five different players hit homers (Lane hit two, while Jordan, Jaylon, Parker Rozenburg and CJ Watson (grandslam) each hit one). Tristan Sizik just missed two HR's by a few feet. Here's the breakdown: Lane (6-16, 4 RBI, 7 runs), Jordan (8-14, 7 RBI, 9 runs), Jaylon (7-11, 4 RBI, 9 runs), Parker (6-13, 7 RBI, 7 runs), Rob (7-14, 4 RBI, 6 runs), CJ (8-13, 8 RBI 9 runs), Tristan (7-14, 7 RBI, 3 runs), Dylan (4-11, 3 RBI, 2 runs), Tyler Delatorre (3-10, 1 RBI, 4 runs), and Yassin Wahhab (3-10, 1 RBI, 4 runs). On defense, Tyler, Jaylon and Yassin each made an inning ending web gem to save runs for the pitcher. 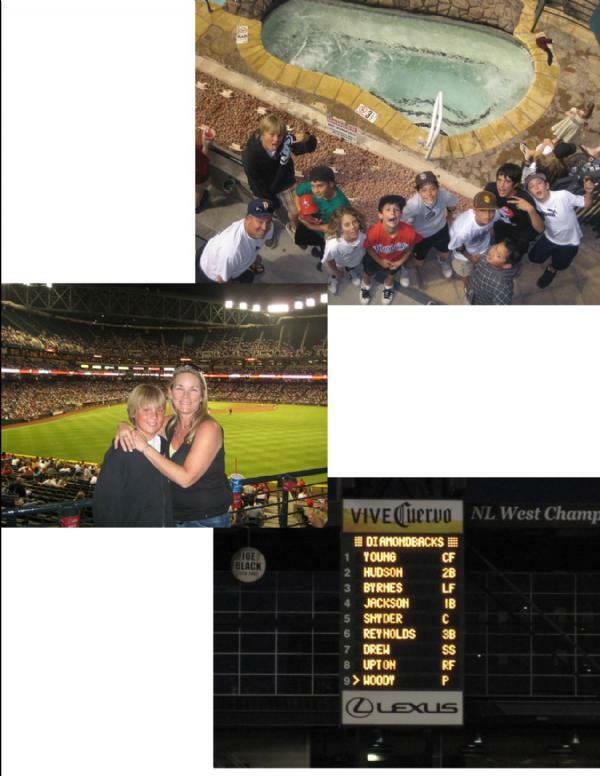 It was a wonderful weekend, and the team went to Chase Field for a ballgame, swam and just hung out together. We will play games on Sundays in April and May leading up to the North City post season and the Slumpbusters Tournament in Omaha, NE in late June. Come out and support the boys as we move into summer. 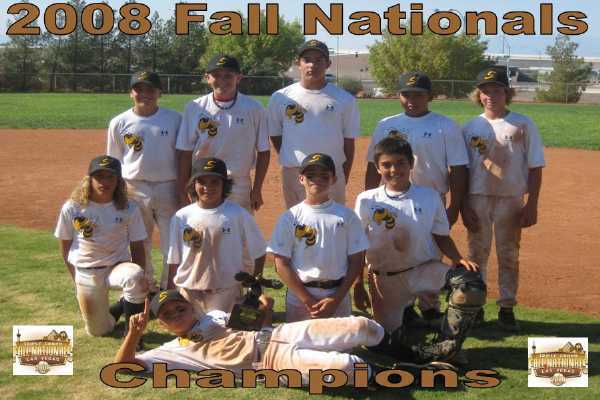 The San Diego Swarm scored in the first inning and never looked back, defeating the Desert Cities Sluggers 10-3 to win the Division two championship at the Triple Crown Spring Championships in Phoenix. More details will be posted tomorrow, as we are all heading home tonight. The San Diego Swarm advanced to the Division 2 championship with a 15-0 victory over the Desert Fire (AZ) on Sunday. The Swarm banged out 10 hits including a 3-3 day from Jordan Pearce, and kept the pressure on from the first pitch. Lane O'Dea pitched a three inning, one hit shutout with 3 K's to get the win. The Swarm await the winner of the Desert City Sluggers/Arizona's Finest game. Jordan will get the start. Check back after 4 PM for the results. The San Diego Swarm came back in the doubleheader nightcap and narrowly defeated the Seattle Select 2-1 to advance to the semi-final game on Sunday. Jaylon King got the win, going three innings and giving up 1 run. Dylan Robertson came on to pitch 2 innings of no run, no hit baseball striking out 3, and Jordan Pearce saved the win with a perfect sixth. Lane O'Dea broke open a 1-1 tie with a solo homer in the third to give the Swarm the victory. Yassin Wahhab, Rob Simsiman, Dylan and Tristan Sizik got the only five hits the Swarm would need. The Swarm now play the semi-final game at 9 AM at Big League Dreams in Gilbert with Lane scheduled to start. The finals will be played at 1:30PM if the Swarm can advance. The San Diego Swarm, disappointed in not receiving a top ten seed, took it out on Douglas County Baseball, posting an 11-1 victory behind Rob Simsiman, who got the win going 4 innings with 5 K's and one walk. The Swarm offense racked up 11 hits. Lane O'Dea, Rob, Dylan Robertson, and Tyler Delatorre had two hits apiece, Yassin Wahhab doubled to the fence in left and CJ Watson cracked a long grandslam homer to pace the Swarm attack. The Swarm resume play at 6 PM in the quarterfinal game. A victory tonight would put the Swarm at Field of Dreams (Wrigley Field) for a semi-final game on Sunday. The Swarm split their pool play games today at the Spring Championships. The second game was a hard fought battle with Tides Baseball with the Swarm falling short 11-7. The offense was led by HRs by Jordan (3 run homer, Parker Rozenburg (2 run homer)and Jaylon went 3 for 3 with a double. Jaylon, Parker and Tristan (in his 2008 tournament debut) pitched to keep the Tides at bay as the offense tried to find its stride. Tonight the Swarm will catch the Diamondbacks and Rockies at Chase Field. UPDATE: Pool Break was determined and the Swarm received the #2 seed in the 2nd division bracket. The Swarm will play Douglas County Baseball at 9AM tomorrow morning. The Swarm arrived in the Valley of the Sun arriving throughout the day. Early arrivals spent time in the pool relaxing. After a night of exploring the greater Phoenix area, the players settled in for tournament play. After the pool games and an afternoon in the swimming pool, the team will take in a spring training game watching the Rockies v. Diamondbacks game at Chase Field. Continue to track the Swarm at www.swarmbaseball.com. The 8U Swarm battled the San Diego Dawgs in three hard fought games to capture runner-up honors in the San Diego Blues Spring Break Classic III. In the first game, the 8U San Diego Swarm used three pichers to post a 2-0 shutout win in the SD Blues Spring Break Classic at Del Dios Park in Lakeside. Steven Radelski, Devin Padua and Zac White combined to shut out the San Diego Dawgs, racking up seven K's, giving up only 2 hits and 2 walks. The offense was led by Devin, who was 2-2 with 2 doubles and Zac with 2 RBI. The Swarm play the Dawgs again for the championship at 12 noon. In the second game, the 8U Swarm battled but lost a 8-4 decision. The offense managed 5 hits highlighted by Steven's double. Vincent, Cameron and Zac held the Dawgs to 7 hits and 6 strikeouts. The championship game was a nail-biter to the end with the Dawgs coming back in the 6th inning to win 10-6. The 10 hits by the Swarm were led by doubles by Devin and Zac. The team hit other balls hard that were caught by good defensive plays. The pitchers - Steven, Devin, Cameron and Zac - combined to allow 8 hits and record 9 K's. Overall, the 8U Swarm continued to improve and gained important experience that will be the foundation of future championships. 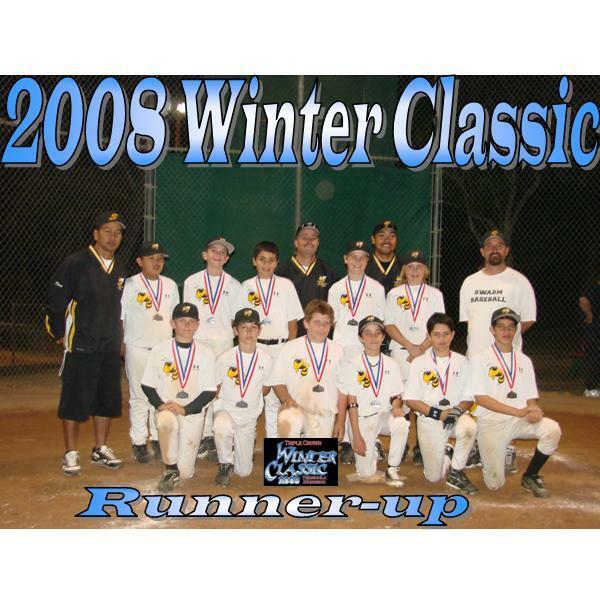 The 11U San Diego Swarm advanced to the tournament championship game for the fourth consecutive time this weekend at the Triple Crown Winter Classic in Fallbrook. The Swarm carried a #3 seed into Sunday's games. After winning their quarterfinal game 7-4 against the CA Terminators, the Swarm defeated the Tomatero's 10's 4-2 in the semi-final game, placing them in the finals against the Corona Young Guns. In a very well-played game, the Swarm dropped a 4-3 decision to earn runner-up medals. The offense for the Swarm was led by Tyler Delatorre, who went 7-10 in the five games, with 6 RBI. Jaylon King, Dylan Robertson, Rob Simsiman, Parker Rozenburg, Lane O'Dea and Jordan Pearce all pitched innings during the weekend. Parker and Jordan picked up the wins (Jordan's five innings to beat the Tomateros was the highlight), while Lane pitched in three games and saved Jordan's game. Tristan Sizik, CJ Watson and Thomas Zlatic added several nice defensive plays, and Matt Myron batted .333 for the tournament. In the past six weeks, the Swarm has entered four tournaments, winning two and finishing second in the other two. We are looking at several options for our next tournament, and want to thank our families and friends for all the support at the games. 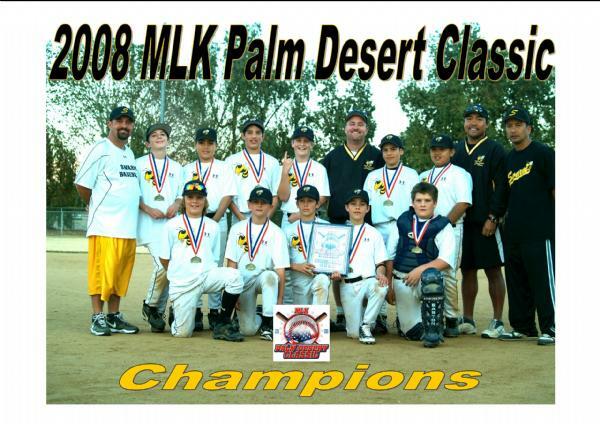 The San Diego Swarm 11U team swept their way to five victories and the 11U championship in the MLK Triple Crown Qualifier in Palm Desert, qualifying them for all national tournaments in 2008. The five victories were earned on the mound by Jaylon King/Rob Simsiman, Parker Rozenburg, Dylan Robertson, Lane O'Dea and finally, Jordan Pearce. Jordan pitched a complete game to wrap up the championship, giving up only 2 runs and 4 hits with 8 K's. The team put on a power hitting display. The first 6 hitters (Lane, Jordan, Jaylon, Parker, Thomas Zlatic and CJ Watson) had 35 hits, 20 of which were extra base hits including the one home run in the tournament by Jordan. Dylan Robertson added 6 hits while Rob Simsiman had 5 hits and was on base 9 of 11 appearances. Tyler Delatorre was on base 7 of of his 10 appearances with 4 RBI. Tristan Sizik made many great plays at third and drove in 5 runs, and Matt Myron played good defense and layed down 3 bunts that ignited innings for the Swarm. The 8U Swarm battled hard but came up short in both games played on Saturday earning a 6th seed in the playoffs. They played a tight game with the RSF Titans in game 3 before dropping a 6-5 nailbiter. The team continues to improve. All of the Swarm families had a great pizza party on Saturday night, and the 11U team received their USSSA championship medals from the previous weekend. Check out pictures from the weekend in Photo Albums. Congratulations Swarm! Next weekend we are off as all Swarm players will be at the North City Youth Baseball park for tryouts. The next tournament is in three weeks, so check back for more details. 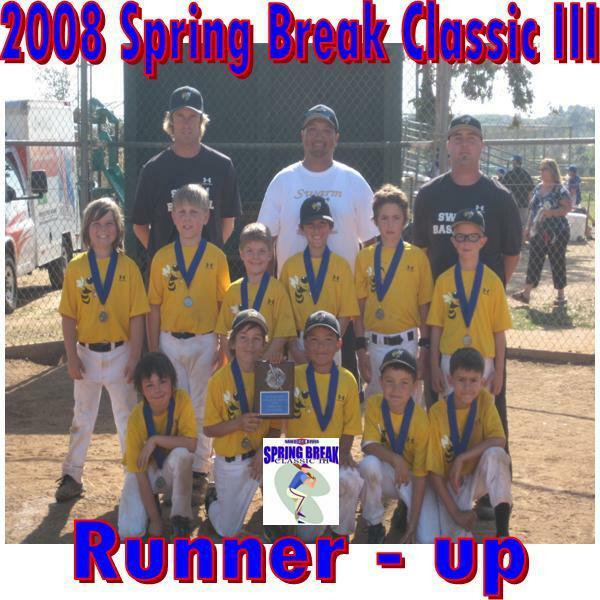 The San Diego Swarm prepared for this weekend's Triple Crown qualifier by winning three games on Sunday to take first place in the USSSA 11U tournament in Poway. The Swarm gained the number one seed in the championship by beating the ABD Waves 12-4, then coming back to beat the Vista Eagles by the same 12-4 score. Lane O'Dea, Dylan Robertson, Jaylon King and Parker Rozenburg held these two teams to four hits with 7 K's in eight innings of work. Parker, Lane and Jordan Pearce drove in four runs between them and scored two runs apiece in game one, and CJ Watson, Lane and Jaylon had extra base hits. Rob Simsiman threw out the first runner in the first to shut down the running game. In game two, Tyler Delatorre had two hits to lead the offense along with Tristan Sizik who scored 2 runs and drove in 2. The play of the day was turned in by Lane and Parker, who completed an 8-2 putout at home with a great throw and tag. In the championship game, the Swarm beat the Gorillas 10-7 behind Jordan, who pitched 4 innings for the win and hit a bases clearing 3 run double in the 4th inning to put the game out of reach. Morgan Roman-Baumeister put down a perfect suicide squeeze bunt and started a key 4-6-3 doubleplay in the 6th to support Lane who picked up a two inning save. Matt Myron completed his perfect 7 for 7 on base day by scoring from first on a single to right by Dylan to score the Swarm's final run. 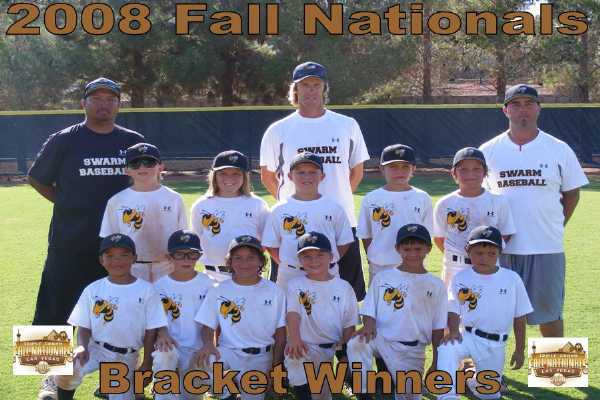 The Swarm resume play on Saturday in Palm Desert along with the 8U Swarm, who are entered in their second tournament. The San Diego Swarm opened up Championship round play in the SD Blues Christmas Break Showdown with a 12-2 victory over the Gorillas, advancing them to the finals where they dropped a 6-1 decision to the So. Cal. Sting. The 3-1 weekend gave the Swarm the 2nd place medal in a tournament where they played up into the 12U division. In the first game, the Swarm scored 11 runs in the first two innings and never looked back. Carson Hermosillo pitched the first two innings to get the win to go along with yesterday's 2 saves. Dylan Robertson pitched the final two innings to get the save. Offense led the way. Matt Myron, Jaylon King and Thomas Zlatic went a combined 6 for 6 with 3 doubles and 6 RBI, while CJ Watson, Rob Simsiman and Tristan Sizik added hits. Carson and Jasper Crusberg each reached base twice and scored 2 runs apiece. The defensive play of the game was turned in when Carson threw home from first to Rob, who applied the tag and threw to second for a 6-3-2-6 doubleplay. In the championship game, the Swarm ran into great 12 year old pitching and could manage only 1 run and two hits. Thomas Zlatic's 2nd inning homer was the lone highlight. Jaylon King started and went three good innings, giving up only 2 runs, and Jasper finished up the final two innings, giving up only 1 run. Tyler Delatorre turned in two great plays in the 5th, throwing out runners at first and second from right field in consecutive plays. Jessie Sullivan turned in another great game at short with several nice plays. The Swarm are back in action on January 13 at the Poway Sports Complex in the USSSA Winter League Playoffs. 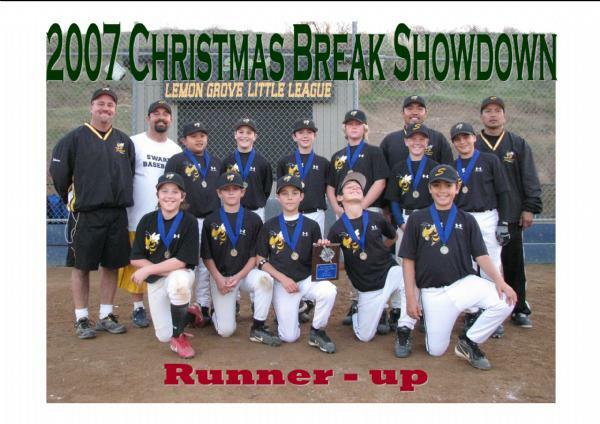 The San Diego Swarm 11U team played up in the 12U division and with the help of three new players defeated the Gorillas 7-4 and the Ballhogs 5-1 in the seeding round of the Christmas Break Showdown in Lemon Grove Saturday. The two wins gave the Swarm the #1 seed going into championship play on Sunday. In game one, Jessie Sullivan pitched the first three innings to get the win, allowing only one run. Jaylon King got through 1 1/3 innings, handing the ball to Carson Hermosillo to get the save with 2 K's in the final inning. Tristan Sizik led the 12 hit attack with a 3-3 day with 2 doubles. Carson went 2-3 with a double and the only home run of the day and Jaylon went 2-2 with a double, single and a walk. In game two, Dylan Robertson pitched the first three innings and facing only one batter over the minimum, gave up no runs or hits and had 3K's to get the win. Rob Simsiman battled control problems but gave up only one run, handing the ball to Carson who racked up his second save of the day. Jessie Sullivan played flawless defense with six assists at short and added a 2-3 day at the plate with 3 stolen bases. Jasper Crusberg cut down a runner stealing behind the plate and added a double and two walks to the offense. The Swarm begin play again tomorrow at 12 noon with the number 1 seed, facing the winner of the Ballhogs vs. Gorillas game.